British land at Lechmere point after they embark from Backbay. They British were delayed from marching earlier because they had to bring up provisions from their boats. The provisions were divided between the troops, each soldier had one day's ration and 36 rounds of ammuntion. The Tufts house (shown at right) was used as a headquaters for the American's during the Siege of Boston. When the British passed by the house, Samuel Tufts was in the back making bullets, but since the British passed by so quietly he never heard them. But a woman across the street, Mrs Rand, who heard the noise ran over to tell Mr. Tufts of the British. But Mr. Tufts did not believe that 800 British Regulars could've walked past his house without him hearing until she showed him the foot prints. Thomas Robis and David Harrington were carrying milk to Boston. They were captured at Menotomy River (now Alewife Brook) and were compeled to go with the British soldiers to Lexington. 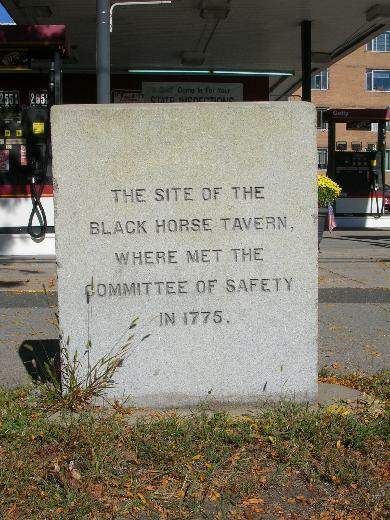 Three members of the Committee of Saftey from Marble head, Colonel Jeremiah Lee, Colonel Azor Orne and Elbridge Gerry were spending the night at the Black Horse Tavern following a session of the Committee. As the troops marched by, they arose from their beds to watch the British pass by. But when an officer and a file of regulars detached from the main company and went to search the house, they fled out the back door in their nightclothes and hid in a field of corn stubble.